When I realized you can setup Kodi subtitles for all movies, even if they originally had no subtitles on Kodi, and that, to get subtitles to display, it doesn't matter if you have media on a home server, or if you stream through addons such as Genesis Kodi Addon or Icefilms Plugin for Kodi, I was amazed not only because of this fact, but also because these subtitles are completely configurable to your liking. You can modify their color, size, position on the screen, delay, give them stereoscopic depth, and have them display in any language. So if your native language is not English, or you are learning some other language and using movies as a helpful way to do it, the subtitles bring yet another level of customization and depth to your Kodi experience that you shouldn't miss. Okay but, how do I add Kodi subtitles? First, make sure you are using Kodi Gotham v13 or higher, since lower versions of Kodi won't support this feature. Also make sure you have a pretty up to date skin. For this tutorial, all images are from the skin “Confluence”, but if you want more skin options don't hesitate to read about our 6 best skins for Kodi in 2015 or the 10 top Kodi skins for touchscreen devices. Once you have verified these minimum requirements, we can start the simple process to add Kodi subtitles. From this dialog you can configure subtitle settings for Kodi. Head to System -> Settings -> Video -> Subtitles from the Kodi main menu, and you will a screen similar to the one above. 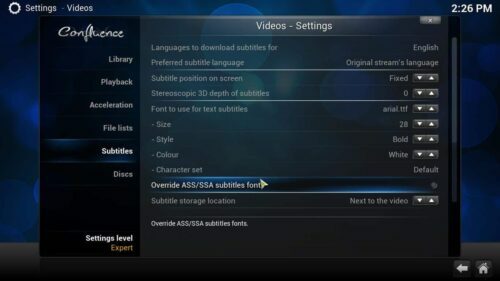 In this screen, you can setup Kodi subtitles the way you like. You can change the subtitle language, the service they download from, and even their appearance. Click on Languages to download subtitles for, and select your preferred languages. For this example I'll choose English and Spanish. 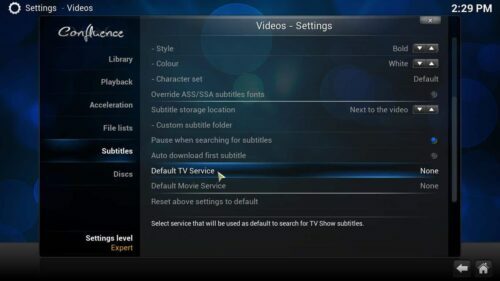 After you're done selecting the language of subtitles on Kodi, click OK.
On the subtitle settings dialog, you can choose default subtitle services for both movies and TV. Scroll down on that dialog box, until you see Default Movie Service. Click on it, and an empty dialog will appear. 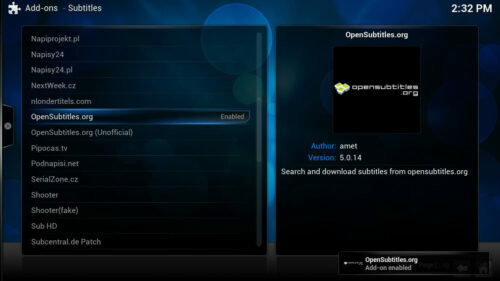 On this dialog, click on Get More... in order to add Kodi subtitles services. You will see a Kodi subtitle add on list. For our example, scroll until you get to OpenSubtitles.org and click it, then click Install on the box that appears. 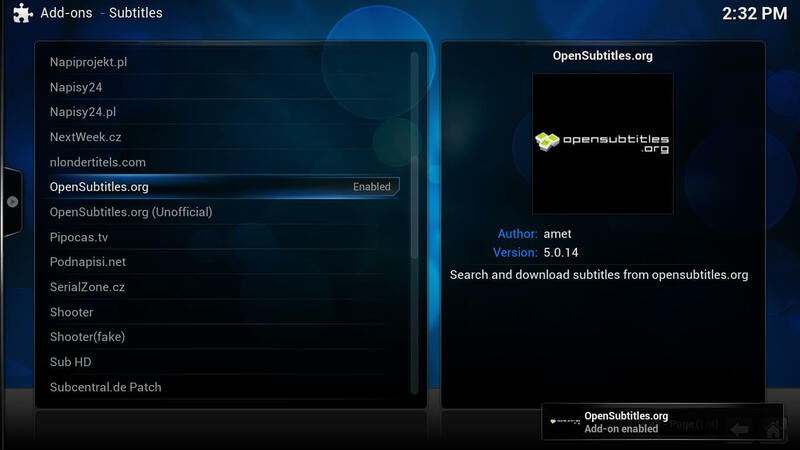 You will see a notification similar to the one on the bottom right of the screenshot below, once you have successfully enabled the service to add Kodi subtitles. Keep in mind you can add other services as well from the list, though the OpenSubtitles.org Kodi subtitles service is fairly complete and useful. When you get that notification it means the subtitles addon for Kodi was successfully installed. You need to actually click the service on the service selection dialog before you can use it. 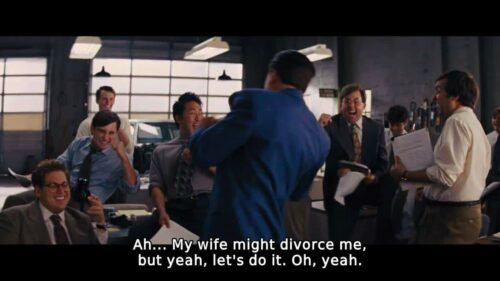 You're all set now. Browse your addons or media content for a movie or a TV show and click the subtitles button when playback starts. You will see a small menu with a Download button. Click on it so you can add Kodi subtitles to your media. You download subtitles directly during playback. When you click on that button, a floating menu will come up. 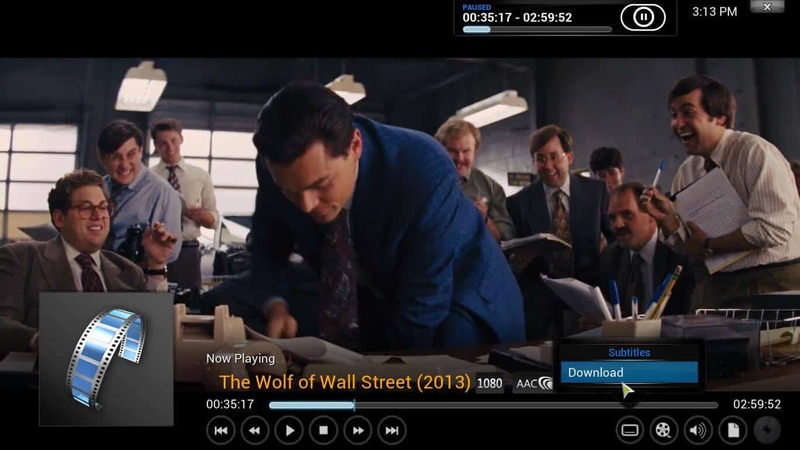 It will allow you to add Kodi subtitles to the movie you are watching. Ratings are displayed beside the subtitles, so make sure you select one with a good enough rating, for the best experience. Select the subtitles you wish. You can see their language and rating in this floating menu. After clicking on any of the subtitles, they will start downloading, and shortly after that, you will see the subtitle menu changed. In order to add Kodi subtitles to your movie, these must be enabled here. You can enable and disable subtitles for your movie now from the playback menu. And that's it, now your playback has subtitles! Subtitles allow you to never miss a memorable or funny quote on your Kodi movies. If you don't like their default appearance (which I find rather easy on the eyes and useful, but to each their own, I guess), you can change it on the subtitle menu, the first one we saw on this tutorial. There you can change the font and color, among other things. All of this setup can be done via a wireless HTPC keyboard or a remote app such as Kore, the official XBMC/Kodi remote app, so you won't even have to get up from your couch to add Kodi subtitles.